After our pleasant hike around Durnstein Thursday, the Scenic Jaspar continued through the Wachau Valley. It is stunning – I can only imagine how much more it would be if the river was at the full level. You pass little villages and towns, monasteries and castles, farms and terraced vineyards. Stunning. Soon after lunch we pull up at Melk. This town is tied to the unbelievably large Melk Abby. I am not sure what rock I have hidden under but was clueless that this part of the world is so tied to the Roman Catholic Church. The Melk Abby at one time apparently had the influence (and affluence) we most often ascribe to the Vatican. The Abby is old. The current buildings cover more about the same square footage as Buckingham Palace and all the grounds. It is the home for the Benedictine order. Thirty two priests are member of this order. Half live in the Abby and are part of the school staff, work in the church there or involved in the monastery business (today with 500k visitors a year, that is primarily tourism.) The others are local parish priests around the world. The school is co-ed, open to girls and boys for what we would consider middle and high school. There is a very good museum there that traces the history of the Abby from its humble beginnings through periods of growth, some periods where the world got way more important than the church, the period of the Reformation, and through today. The focal word of the Abby is “to listen”. We also saw the Marble Room, the Imperial Wing (when Maria Therisia and her Hapsburg entourage came to celebrate mass and for other events at the Abby they stayed for a while). Other guests included Mozart and other celebrities of the day. We walked through several galleries of the library – beautiful old books that can be accessed under agreed conditions by most anyone. The final stop was the Abby church. I have been in many churches and cathedrals across the globe. This was probably the most ornate we have seen. I am sure I missed something there I would like to have remembered but it was HOT. 102.2 F hot. The A/C was “on” in the Abby but with all those folks (and the add on of people due to the Assumption Day holiday weekend), it was like being in a dry sauna (humidity was 0). From there we traveled up to the ruins of the castle overlooking the area – Castle Aggstein – 12th century – for end of day scenic views. This castle was seized by the Turks 15th century and ruined. The Castle was never rebuilt after that though a good part of it still remains intact today. On Saturday, we had a great adventure. First we had to disembark Scenic Jasper since the water levels around Passau were too low for the ship to traverse safely. We knew all week this might happen. These folks have plans for such as this and they put it into effect. Via the tours that day, we literally swapped to the sister ship Scenic Opal which is essentially a carbon copy of Jasper (and a few months older). We did have to pack up and unpack again but that was it. There are a few subtle differences (Steve called them “Twilight Zone” moments) but I love effectively carried out logistics and this was stellar. I know from talking to the Cruise Director (only staff member who swapped with us) that there were a few hiccups but not many (or any from our perspective). We travelled to Salzburg for the day. Our guide Eva – an American born German who came to Germany to study the language and stayed. She was very good. She took us off the motorway on the final segment into the city so we could see up close the countryside. If you love The Sound of Music then you will know what it looked like. She showed us set locations from the movie as well as the real locations of the events (church from movie where married, actual church where married, actual convent, etc.) related the story to the true story of the Captain and Maria, showed us the homes of great conductors and inventors (including Doppler who studied the blood flows in the body and invented mammography). We saw the birthplace and adult home of Mozart and learned of the tragedies of that family – Mozart died in his 30s, had smallpox as a child, his sister was forced to marry for position and as retaliation she abandoned her music, and their father who apparently was a tyrant. We heard a regular Saturday band concert in Mirabelle gardens and hundreds of people gathered round to hear. Under one of the arches that surround the Cathedral courtyard, we heard a trio – clarinet, bass, accordion – playing for pocket change and let me tell you, those young dudes (early 20s) could flat play. They did some jazz improvisations on classical pieces. Amazing. Music was everywhere. We had lunch in a monastery restaurant that has been serving food in that location since 832 A.D. – St Peters – that was wonderful – Wiener schnitzel with potatoes, bread, and apple strudel. We shopped a little (as you know I don’t shop much and Steve even less). We saw from a distance the Salzburg Castle, many many churches – around the square at the Dom I counted four, the street fair and the shopping street that goes back 800+ years. From there we drove though the Austrian countryside and crossed the border into Germany close to Passau. Being in the EU makes that so easy these days. The buildings are still there, however, that remind you such was always not the case. 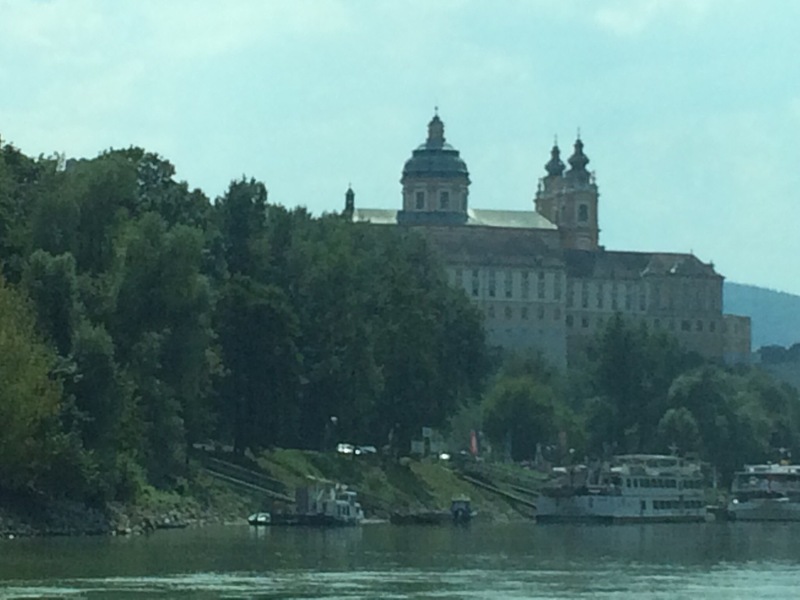 We drove on to Regensburg, which is on the Rhine, and boarded the Scenic Opal. Needless to say, we were tired. Truckers cannot be on the highway in Germany on the weekend. They pull off into truck plazas late Friday and cannot return to the highways until Monday mornings. Busses can travel 100 kilometers per hour on the autobahn. There are not restrictions for cars still. Bavarian ladies tie the ribbon on their apron based on whether single, married or widowed. And that lacy white blouse is actually only underwear, tied off just under the bust. The leather pants of the Bavarian men are passed down from generation to generation. There are some related customs regarding ladies who marry these fellows😳. Himmler occupied the Trapp lodge (think Sound of Music) during WWII. The home is today a hotel decorated reminiscent of that era. This morning we slept in and the chose to stay aboard for the ride down the river to Nuremberg rather than do a tour. The temps are in the low 70s and it actually has rained some. They certainly need it. I even had to dig out my jacket which I have certainly not needed until now. Hebrews 4:13a Nothing is all creation is hidden from God’s sight. That verse came alive this morning while reading and I thought about the history of this area. These people fought all the time. And they took advantage of people. And they used and misused “the church” for their own benefit. And so have/are we. And God knows because He knows our hearts.